The Map of Food Safety and Climate Change, produced by the World Food Program (WFP) and the Hadley Center Met Center, illustrates how powerful adaptation and mitigation efforts will prevent globally the worst impacts of climate change on hunger and will help people be less vulnerable to insecurity in food. 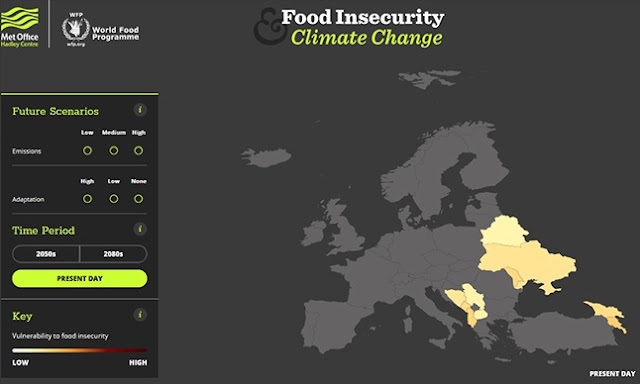 According to this chart, Albania turns out to be the country with the greatest climate change concerns in terms of food security. The figures show that nowadays, in 2018, our country is part of a group of endangered countries. While over the years, the projections for Albania are dark. According to the map, the risk of access to food will increase by 23% in 2050 in Albania, while for the rest of the Balkans the risk is lower. Namely, 22% for Montenegro, 21% for Serbia and Macedonia and 19% for Bosnia. Meanwhile, the 2050 projections suggest that Albania will grow by more than 48% from the effects of climate change on food. Figures talk about lower risk in the Balkans, namely Macedonia 45%, Montenegro 38%, Serbia 36% and Bosnia and Herzegovina by 33%. Over the past two decades, 200 million people have been rescued from hunger and the prevalence of chronic malnutrition and in children has decreased from 40 to 26 percent. Despite this progress, according to the World Bank, 702 million people still live in extreme poverty and according to this year's report on the World Food Insecurity (SOFI) situation, 793 million people are at risk.